Asus intends to up the ante when it comes to the world of gaming notebooks, this time round expanding the Republic of Gamers (ROG) collection with the G74SX model. Just what can you expect from the G74SX? How about incredible visual performance as a staple for starters, thanks to the use of a 2nd generation Intel Core i7 CPU and NVIDIA GTX 560M GPU with 3GB of GDDR5 VRAM? Not only that, the G74SX is said to support the latest Microsoft DirectX11 graphics, making sure your eyes will always experience popping visuals without dropping any frame rates in the process. Not only that, the G74SX will work in tandem with NVIDIA 3D Vision and 3DTV Play technology, making sure the 3D revolution can be carried with you wherever you go – either that, or you can always hook it up to a 3D-capable HDTV just in case you need a larger viewing real estate. To pair up such performance with looks has been a mission statement of the Asus G74SX right from the beginning as it boasts a sleek updated stealth design coupled with a matte black exterior, ergonomic keyboard, soft touch palm rest and new dual intelligent fan technology to send all heat to the back of the notebook, letting you have a quieter and cooler gaming experience even late into the night. With the ability to install up to 16GB RAM, you shouldn’t run into memory issues with this puppy anytime soon. Not only your eyes will enjoy the G74SX’s graphical details, this notebook will also keep your ears happy with 8-channel HD audio with THX TruStudio and Creative EAX Advanced HD 5.0 compatibility. Think that you need more processing firepower? No problem, as there is on-the-fly overclocking. Know anyone who is going to upgrade their gaming notebook anytime soon? 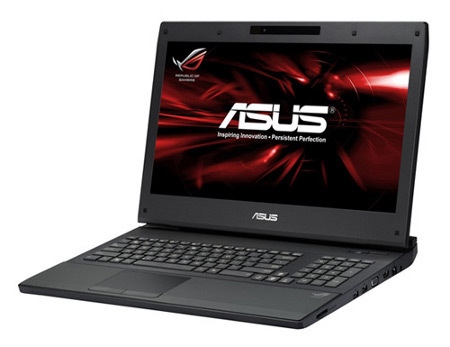 You might want to put in a good word for the Asus G74SX.